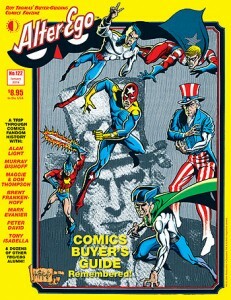 Alter Ego Remembers Comic Buyer’s Guide! On December 11, TwoMorrows Publishing’s ALTER EGO #122 goes on sale in comics book shops worldwide, presenting a tribute to the late, great Comics Buyer’s Guide, offering CBG‘s founders and past contributors a chance to pay their respects to the long-running newszine. This 80-page full-color magazine, retailing for $8.95, is available for immediate shipping from TwoMorrows’ website (www.twomorrows.com), in both print and digital formats, and on the Apple Newsstand/App Store and Google Play storefront through the new Alter Ego App. Comics Buyer’s Guide was founded in February 1971 by Alan Light, originally as a monthly tabloid newspaper called The Buyer’s Guide to Comics Fandom. An entire generation of comics fans in the 1970s looked to TBG for its comics news and as a marketplace for buying and selling comics in those pre-Internet days. TBG was purchased by Krause Publications in 1983, and the company changed its name to Comics Buyer’s Guide, and installed Don and Maggie Thompson as editors. Throughout the 1980s, CBG was a prime source for comics journalism and insights, but the changing landscape of the 1990s comics industry brought in other publications that, along with the Internet, gradually ate away at the publication’s popularity. CBG was eventually cancelled in early 2013 at issue #1699, without offering contributors a final issue to say “goodbye” to the long-running industry icon. Alter Ego #122 took on the task of giving comic book fans an idea of what CBG #1700 might’ve looked like, through history and remembrances from founder Alan Light and Murray Bishoff about the original TBG, and Maggie Thompson and Brent Frankenhoff about CBG. The issue also presents new “final” columns by CBG stars Mark Evanier, Tony Isabella, Peter David, Fred Hembeck, John Lustig, plus classic art by Don Newton, Mike Vosburg, Jack Kirby, Mike Nasser, and many other professionals who graced the newszine’s pages over its more than 40 years of publication. The cover features an illustration by fan-favorite artist John Fantucchio which originally appeared on the cover of TBG #1, in color for the first time. This issue also features a special FCA (Fawcett Collectors of America) section spotlighting CBG’s fondly-remembered “Goodguy” parody of Captain Marvel, as well as Michael T. Gilbert reminiscing about Mr. Monster’s roots in CBG, plus historian Bill Schelly’s overview of fandom before TBG came along. Alter Ego is edited by former Marvel Comics editor in chief and top writer Roy Thomas. Since 1994, TwoMorrows Publishing has been bringing a new day to comics fans, through its award-winning line of magazines and books.